Duo Country US formé en 1958 à Darby (Floride) par Howard Bellamy (né le 2 Février 1946 à Darby (Floride)) et David Bellamy (né le 16 Septembre 1950 à Darby (Floride)). 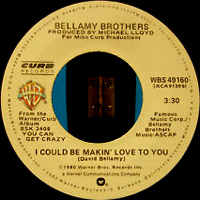 Les "Bellamy Brothers" font leurs débuts à la fin des années soixante, se faisant connaître en 1976 avec "Let Your Love Flow". Influencé par le Country Rock Californien, ce bon duo Vocals saura également développer un style personnel grâce à l'emploi d'un matériel original. Although the Bellamy Brothers are the most successful duo in country music history, they have never been favored by the critics. That doesn't mean their music was rote, by the book, and formulaic country-pop. 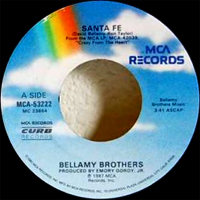 More than most acts of the late '70s and '80s, the Bellamys pushed the borders of country music, adding strong elements of rock, reggae, and even rap. Nearly a decade after their first hit — the 1975 pop chart-topping, Southern rock-tinged "Let Your Love Flow" — the brothers had earned a stack of best-selling records, and critical respect came by the late '80s. By that time, they had firmly established themselves as the top duo of the '80s, both in terms of popularity and musical diversity. Both Howard and David learned how to play a variety of instruments in their childhood. Neither child had any formal training, but Howard managed to learn the guitar, banjo, and mandolin, while David learned the piano, accordion, fiddle, banjo, organ, and mandolin. Both brothers went to college at the University of Florida. While they were students, they had their first paying gigs — playing fraternity parties. Howard and David both earned degrees at the University of Florida; Howard majored in veterinary medicine, while David earned one in psychology. In a short time, the move paid off. In 1973, they met a friend of singer Jim Stafford, who directed the Vocalsist to David's "Spiders and Snakes." Stafford was immediately taken with the tune, releasing it as his next single; the humorous retelling of David's boyhood farm experiences would eventually sell over three million copies. 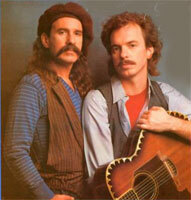 The success of "Spiders and Snakes" gave the Bellamy Brothers enough money to move out to Los Angeles, where they began to concentrate on a full-time musical career. By the turn of the decade, the duo switched record labels to Atlantic. 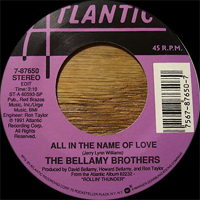 After one album with Atlantic, 1991's Rollin' Thunder, the Bellamys left the label, founding their own record company, Bellamy Brothers Records, one of the first artist-driven country independents of the modern era. The Latest & the Greatest (1992) was the first album released on the label. 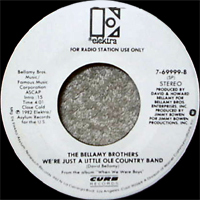 The duo still reached the charts, like the Top 25 "Cowboy Beat," but the strongest proof of the Bellamy Brothers were their reliably large crowd, not just in the U.S. but throughout the world. 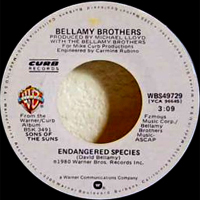 The Bellamys put out numerous independent records during the '90s and following the 98 collection Reggae Cowboys, the duo switched to Blue Hat Records on for 1999's Lonely Planet. 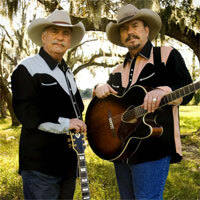 The Bellamy Brothers' biggest project of the new millennium was Angels & Outlaws, Vol. 1, a 2005 record for Curb which found the duo re-recording old hits with a host of other country superstars, including Alan Jackson, Tanya Tucker, and Dolly Parton. 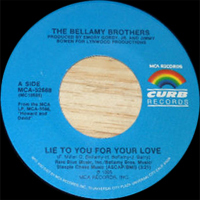 Following 2007's gospel album Jesus Is Coming, the Brothers released The Anthology, Vol. 1, a collection of re-recordings of career highlights that also featured new recordings, including a duo with the Bacon Brothers on "Guilty of the Crime." 1989 SP MCA / CURB MCA-53595 (US) Crazy From The Heart / ? 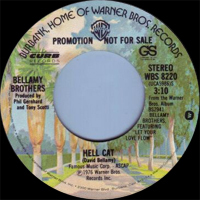 04/1990 SP WARNER BROTHERS 7-19874 (US) The FORESTER SISTERS With The BELLAMY BROTHERS - Drive South / ?